Sushi rolls, known as makizushi in Japanese, are only limited by your imagination—and your ability to roll them neatly, of course. 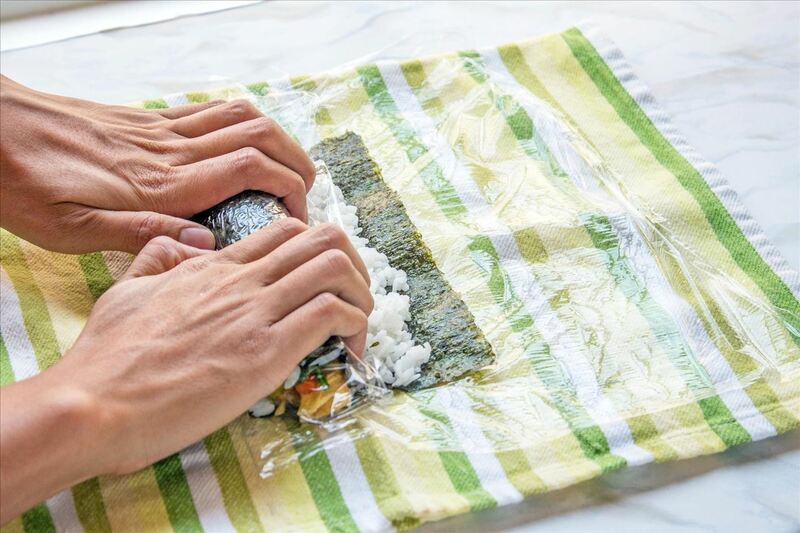 While it may seem like a lot of effort, rolling sushi is a snap if you have the right tools. 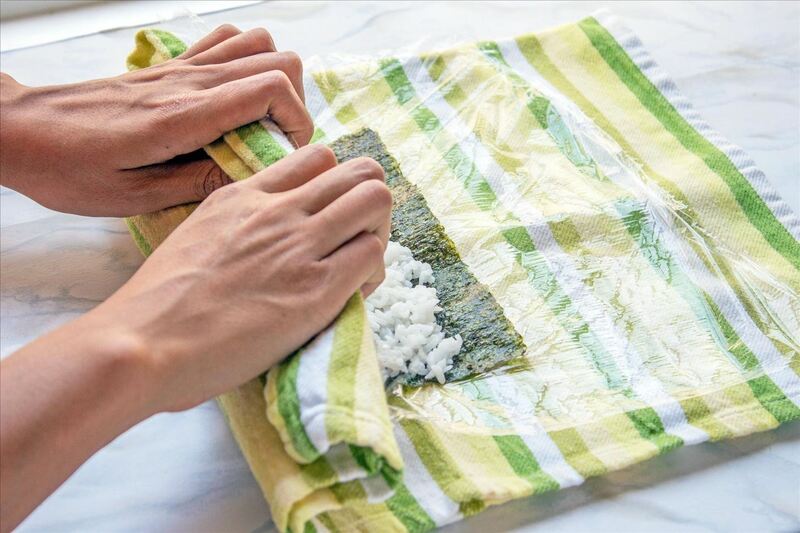 If you plan on making sushi rolls a lot at home, a bamboo mat is the way to go, but a tea towel—or even just your bare hands—will work if you only want to make them occasionally. No matter which tool you end up using, the method for rolling sushi is exactly the same. 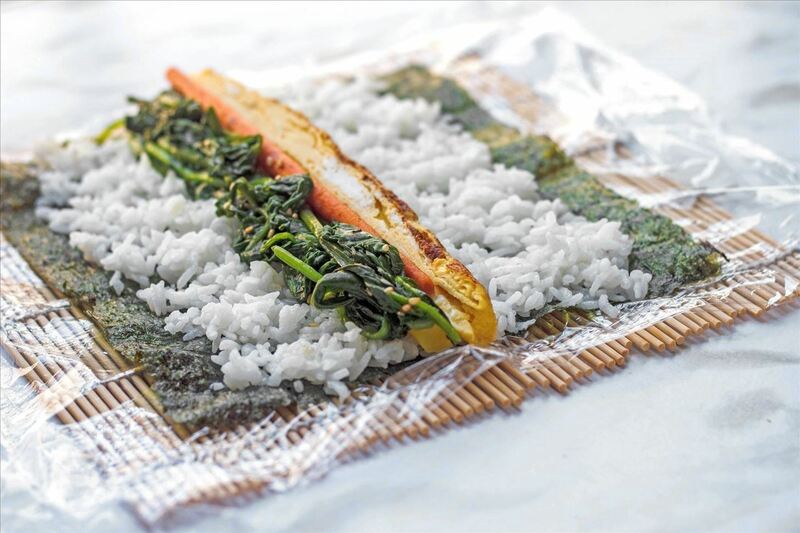 For this demonstration, I'm making kimbap: a Korean roll that contains tamago, spinach, burdock root, and pickled daikon radish. Lay out your bamboo mat with an optional piece of plastic wrap on top (to keep the mat clean). 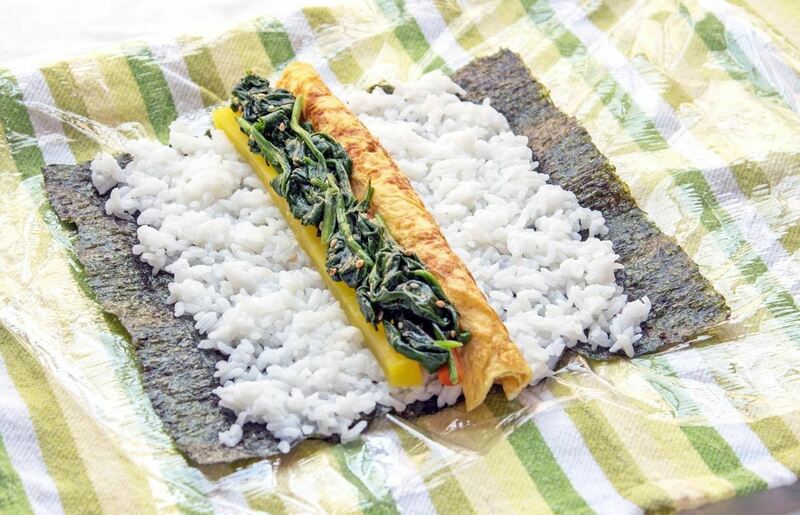 Evenly spread rice over the nori while leaving space at the top and bottom of the sheet. 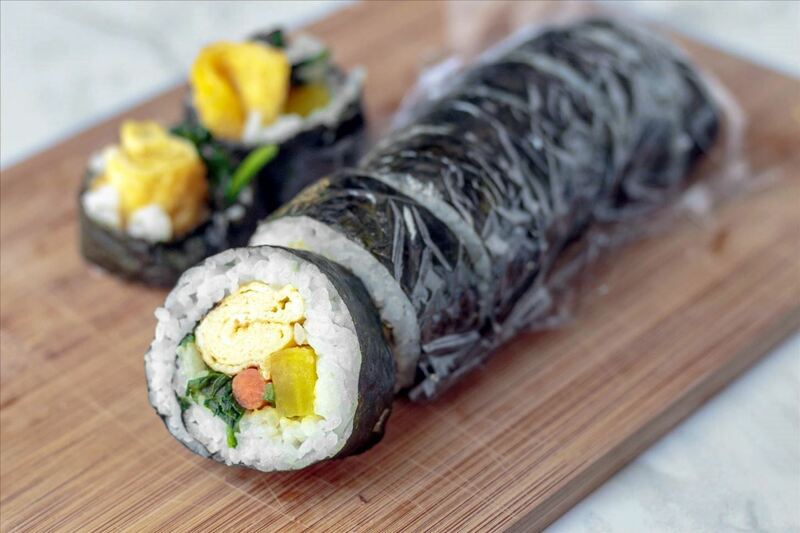 Place your chosen ingredients in the center, halfway between the top and bottom of the seaweed. Place your thumbs underneath the bamboo mat and lift the edge that is closest to you up and over the filling in the center. Curve the rest of your fingers over the bamboo mat and gently press along the length of the "log." 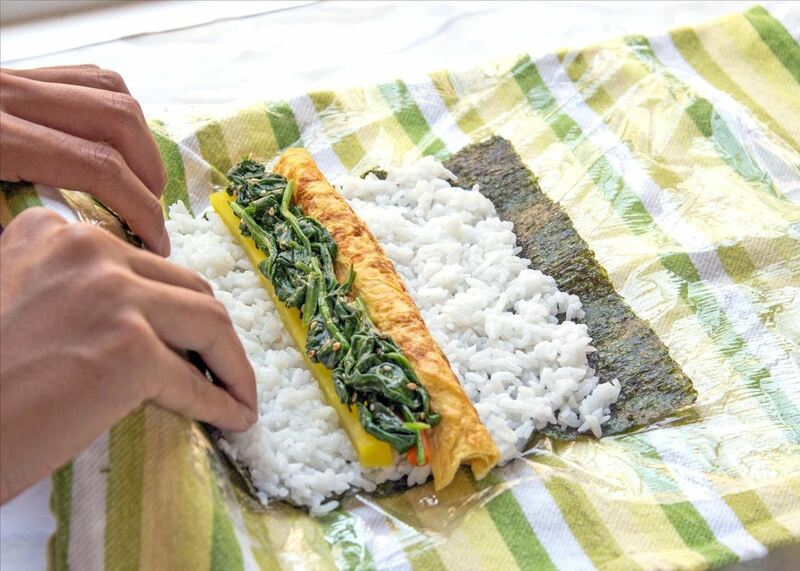 This motion presses the rice and the filling together and prevents the roll from being too loose. 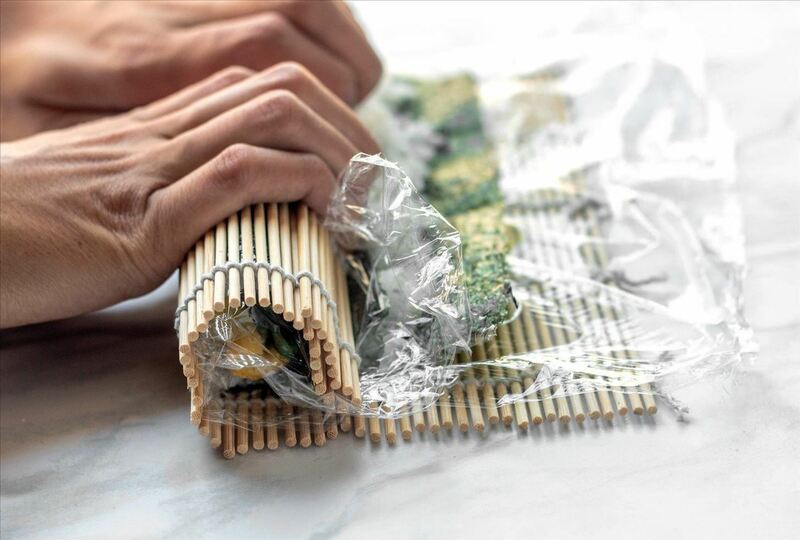 Pull the edge of the bamboo toward you to fold it underneath your hands (as shown in the picture below), then continue to roll the sushi away from you until you've rolled past the far edge of the seaweed sheet. Bamboo mats are very affordable and relatively easy to find; most Asian grocery stores carry bamboo mats in their kitchenware sections. If no Asian stores exist around you, Amazon has a bamboo mat and rice paddle for less than $4.00 (the paddle is used to mix rice vinegar into the rice without snapping any grains). A bamboo mat isn't essential for a great sushi roll, so if you don't have one or don't want to get one, that's okay. In a pinch, I've found my tea towel (also known as a dish towel) to be an excellent substitute. When I use a tea towel, I start my roll with the same setup as I would for a bamboo mat. This time, I definitely recommend using plastic wrap: if your tea towel is rough, it can catch and rub against the seaweed. Place your thumbs underneath the tea towel and lift the edge closest to you up and over your filling. Keep your hands a few inches apart when lifting the edge to ensure an even roll. Press gently with curved hands to shape the roll into an even log. Pull the tea towel back and away from the roll. Continue to press gently along the length of the log as you roll it away from you. Make sure that your roll is tightly packed—otherwise, it will fall apart when sliced and divided. 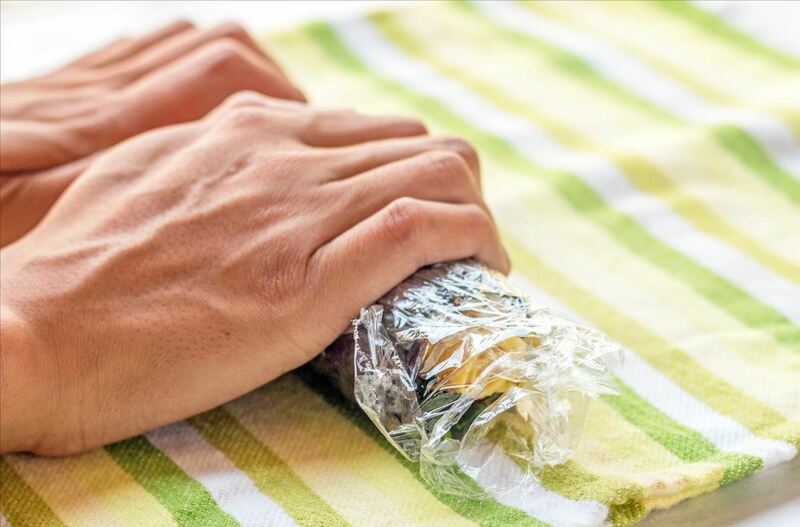 If you don't want to use a tea towel, you can just use the plastic wrap, but you might not get as tight a roll. 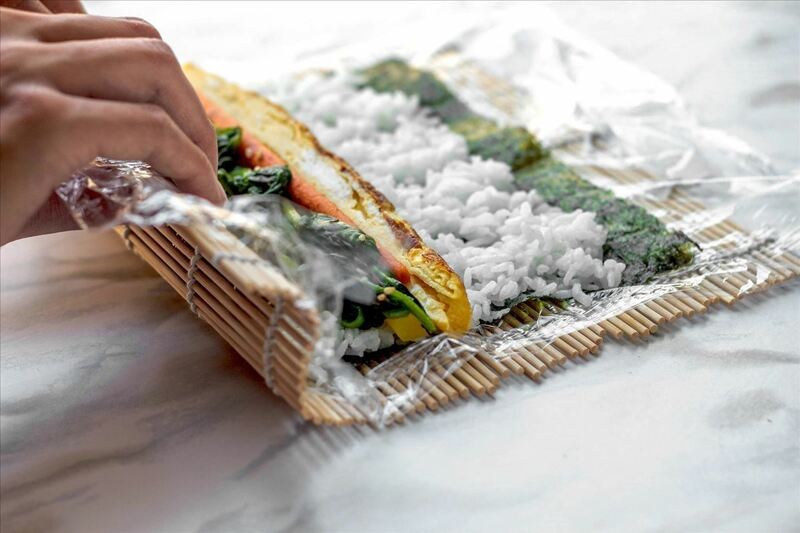 Using the plastic wrap traps the moisture between the rice and the seaweed and makes the seaweed more pliable when rolling. It's also a great way to avoid washing your tea towel or bamboo mat—and less dishwashing is always a worthwhile hack for me. Wipe your knife with a wet dish cloth between each cut to keep the rice from sticking and getting messy. The sharper the knife, the cleaner your cut will be. The ends will always be the loosest part of your roll, so be more careful with them: otherwise, you'll unravel your hard work. Sushi rolls take a bit of practice; I admit that my first few attempts were far from picture-worthy. But the payoff is certainly worth the time that you invest. Even if the practice itself becomes frustrating, the failed rolls still taste as delicious as the well-made ones!